TestPoint announces Vansah 4.3 now including Patent Synthetic Application Monitoring VSAM Solution. TestPoint is excited to announce the latest release of Vansah 4.3 now including Patent Synthetic Application Monitoring technology – Vansah VSAM. Vansah 4.3 is TestPoint’s innovative exclusive solution helping customers with real-time monitoring and reporting for application performance and availability across any environment in development or production. VSAM leverages proven script design capabilities available within the industries most trusted functional automated testing tools such as (QTP, UFT, TestComplete, SoapUI, Selenium, SilkTest, RFT, Telerik, Tosca and more) or the choice of Vansah inbuilt scripting engine, to instantly create powerful monitoring profiles across complex business applications (legacy, cloud/web, mobile) run from any network even simulating cross sites/geographic networks. Vansah simulates real business transactions within your environment actively monitoring the performance, availability and verification of your KPI’s, events for each business transaction alerting and reporting with drill down charts to specific pages (with screen shots), business requests and performance responses. Taking it one step further Vansah introduces video replay recordings for a particular event allowing you to replay the transaction at any point in time to understand and diagnose the root cause of the performance and availability issue. Vansah supports literally any application (citrix, sap, oracle, latest web and mobile application technologies) due to its smart scripting plugin framework which is lightweight and ready to simulate any complex transaction in less than a few moments. Our customers are amazed at the powerful Vansah VSAM capabilities especially when they can leverage off existing scripts previously developed by their current tools. Utilise existing functional test scripts which you may have designed with your tool of choice. Replay videos for a transaction occurring from any monitoring node. So why does TestPoint provide Synthetic Application Monitoring Solutions and Consulting ? 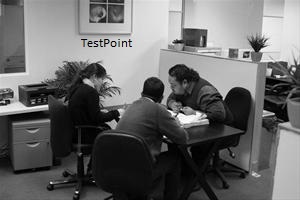 In 2008, TestPoint introduced synthetic application monitoring solutions and strategies helping customers identify and rectify performance bottlenecks and application stress points earlier in the development cycle dramatically reducing costs and improving stakeholder confidence when going to the market with new technology. Organisations are entrusting TestPoint with their most important business needs which is to understand their end users experience and application availability. The task of making sure business applications are available and performing to service level agreements is critical for our customers. We pride ourselves on offering our customers responsive, competent and excellent solutions and services especially in areas where others are shy to assist. how do we know everything is working fine? how was the system performing prior to our technology upgrade or change requests? can we go live without any major issues? TestPoint’s short answer is we capture data from unlimited sources necessary, grouped against application configuration settings. This information is reported with precision response time accuracy supported by patent technology capturing compressed videos, screen shots, memory utilisation, log files and much more information linked to business transactions. The information is accessible and can be shared across key users capturing comments made to investigate or resolve an issue with ongoing historic event reporting. Our customers require TestPoint to bench mark their application performance, availability and the user experience of any application helping with important decision making such as moving data centers, application virtualising, physical server upgrades, latest changes to production environments or investing in new technology which may or may not be managed by our customers directly. TestPoint consultants are more engaged with our customers SME’s, Developers, Architects, infrastructure specialists when it comes to Vansah VSAM. Consultants are reporting on the overall performance of our customer’s applications across build cycles picking up on the slightest impact early in the development cycle all the way through to production. Find out how we can enrich your application experience with a proof of concept empowering you to achieve your business goals.